Buy microphones for karaoke at amazing discounts. This setup is both reliable and very affordable. The VocoPro's VHF-3005 is your way to freedom of expression. 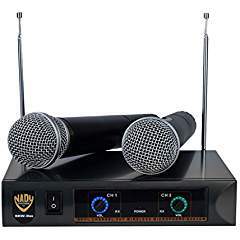 This dual channel wireless VHF microphone system is the perfect solution for home karaoke machines, public speaking, smaller gigs and more. Both channels include independent volume controls for precise vocal balancing and individual quarter inch outputs for use with a receiver or mixer, allowing you pro-quality control over your vocal mix.